Regular cleaning of the system must be sceduled to ensure optimal operating pressure at all times. It is recommended that the unit be cleaned every two weeks if using batch sodium hypochlorite (bleach). And once a month if using continuous process sodium hypochlorite (bleach). 1. Set controller to feed mode. 2. Close chlorine shut-off valve. 3. 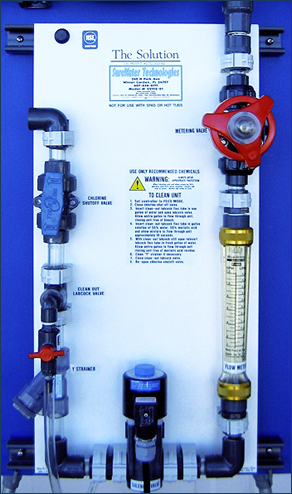 Inset clean-out labcock flex tube in one gallon of clean water and open labcock. Allow entire gallon of water to flow through the unit, rinsing the unit free of bleach. 4. Insert clean-out labcock tube in gallon solution of 50% water, 50% muriatic acid (20% baume) and allow acid mixture to flow through the unit for approximately 10 seconds. 5. With clean-out labcock valve still open, re-insert labcock flex tube in fresh gallon of water, allow entire gallon to flow through the unit, rinsing the unit free of muriatic acid residue. 6. Clean y-strainer if necessary. 7. Close clean-out labcock valve. 8. Re-open chlorine shut-off valve. NOTE: These complete cleaning instructions are also located on the face of each unit.